The karavai was used in many traditional rituals, including weddings and funerals. For centuries, bread in Russia has been a symbol of fertility and prosperity, with a special role reserved for a round loaf, called a karavai due to its symbolic resemblance to the sun. The karavai was used in many traditional rituals, including weddings, funerals, and housewarming celebrations. The tradition of making a wedding karavai has survived to the present day. In olden times, this task could only be entrusted to a happily married woman who had docile and obedient children. Ancient Slavs believed that such a woman was capable of imparting part of her marital happiness to the newlyweds through the karavai. Whereas the task of placing the wedding karavai into the oven could be performed only by a married man. The bigger the wedding karavai, the happier the young family would be. Sometimes karavai were made so big that the whole stove had to be dismantled in order to remove them from the oven. Biting or breaking off pieces from the ceremonial loaf was not allowed, and it could be kissed only three times. The karavai was then cut into slices during the wedding meal. Interestingly, the cutting could only be done by a child. For a housewarming party, very big karavai were usually made, which is not surprising given that the guests included the whole family, with distant relatives and friends coming from afar. The dough was traditionally made by the head of the family, with the wife doing the baking. The karavai was placed at the center of the table. It needed to be big enough for each guest to have a slice. Small bits of the loaf were then hidden in the corners of the new house, as a charm against bad luck and trouble. A karavai accompanied a person on their final journey too. It was made before the funeral, and during the ceremony it would be placed on the coffin. After the burial, the karavai was served at the wake: A slice of it was offered to everyone who had attended the funeral. Interestingly, the funeral karavai was in no way different from the wedding one, and if the deceased was a young single man, it was like a wedding symbol, signifying the man's union with earth. 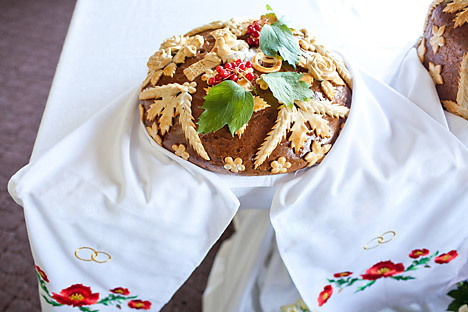 As part of a traditional Russian welcome ceremony, the hosts bring out a karavai on an embroidered towel and offer it to the guests or visitors. For newlyweds, the loaf is placed on the two red edges of the towel, with the blank middle left sagging. The karavai was usually brought out by the mother, while the father carried an icon for blessing the newlyweds. The embroidery on the towel was significant too in that it symbolized a person's ties with their ancestors. At first, karavai were a rather plain affair, apart from a modest plait here or there. Later they began to be decorated with elaborate dough ornaments and arrow-wood, which pagans believed possessed some mystical qualities. Arrow-wood berries and branches symbolized love and happiness. As for the salt cellar placed on top of a karavai, it is optional. It was hardly ever used with a wedding karavai but was always present with the "bread-and-salt" karavai used to welcome guests. The symbolic meaning of the salt is that the person who is being treated to the karavai gets the last chance to nasolit' (meaning, literally, to add salt and, figuratively, to do a bad turn to someone) to the hosts, or, in the case of newlyweds, to each other. After which everybody is supposed to be kind, decent and caring toward each other. First published in Russian in Russkaya Semerka.